COOPER, Henry Allen, a Representative from Wisconsin; born in Spring Prairie, Walworth County, Wis., September 8, 1850; moved with his parents to Burlington, Wis., in 1851; attended the common schools; was graduated from Burlington High School in June 1869, from Northwestern University, Evanston, Ill., in 1873, and from Union College of Law (then the legal department of Northwestern University and of the old University of Chicago) in 1875; was admitted to the bar and commenced practice at Burlington, Wis.; elected district attorney of Racine County in November 1880; moved to the city of Racine in January 1881; reelected district attorney without opposition in 1882 and 1884; delegate to the Republican National Conventions in 1884, 1908, and 1924; member of the State senate 1887-1889 and author of the bill which became the law first establishing the Australian secret ballot system in the State of Wisconsin; unsuccessful candidate for election in 1890 to the Fifty-second Congress; elected as a Republican to the Fifty-third and to the twelve succeeding Congresses (March 4, 1893-March 3, 1919); chairman, Committee on Rivers and Harbors (Fifty-fifth Congress), Committee on Insular Affairs (Fifty-sixth through Sixtieth Congresses); unsuccessful candidate for reelection in 1918 to the Sixty-sixth Congress; again elected to the Sixty-seventh and to the four succeeding Congresses and served from March 4, 1921, until his death; had been reelected to the Seventy-second Congress; died in Washington, D.C., March 1, 1931; interment in Mound Cemetery, Racine, Wis.
Microfilm: In the Robert M. La Follette Papers, 1879-1910, 161 reels. Correspondents include Henry A. Cooper. Microfilm of originals in the Wisconsin Historical Society. Papers: 1801-1934, 1.6 cubic feet. Correspondence and speeches of Henry A. Cooper, mainly in conjunction with his service as a Wisconsin Congressman, 1892-1919, 1921-1931. Much of the correspondence concerns Henry Cooper's work as chairman of the House Committee on Insular Affairs, 1899-1908, and it includes a lengthy exchange with William H. Taft on Philippine affairs. A large portion of the collection consists of letters from constituents, 1914-1917, regarding Cooper's opposition to the armed ship bill, the declaration of war, and the conscription bill of those years. The rest of the correspondence deals largely with the organization of the Republican Party, both state and national. A few speeches by Cooper, a diary of his tour of the Far East in 1905 as a member of Secretary of War Taft's party, memoranda books, and a diary kept by his grandfather, Joel Cooper, in Rochester, Vermont from 1801 to 1869 are also included. A register is available in the repository. Papers: In the Charles R. Boardman Papers, 1896-1945, 1.2 cubic feet. Correspondents include Henry A. Cooper. A register is available in the repository. Papers: In the Brian J. Castle Papers, 1865-1937, 1.2 cubic feet. Subjects include Henry A. Cooper. Papers: In the Albert and Flora Ellinger Papers, 1850-1976, 11.2 cubic feet. Correspondents include Henry A. Cooper. A register is available in the repository. Papers: In the Charles D. Rosa Papers, 1911-1952, 6.8 cubic feet. Correspondents include Henry Allen Cooper. A register is available in the repository. ------. National security league. Washington: Government Printing Office, 1919. United States. 72d Cong., 1st sess., 1931-1932. House. 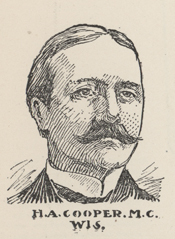 Memorial services held in the House of Representatives of the United States, together with remarks presented in eulogy of Henry Allen Cooper, late a Representative from Wisconsin. Seventy-second Congress, first session. Washington: Government Printing Office, 1931.